Mutual dreaming, an experiment during the IASD’s annual psiberconference | van Doorn on dreaming! This paper reviews the findings of the experiment in mutual dreaming performed by participants of the IASD’s annual Psiber Dreaming Conference. The challenge for the dreamers was to meet each other in dreams. They were given a designated place to meet in their dreams by using a photo of two chairs on a beach. Participants were paired up in couples and dived into a sender and a receiver. The sender received through email the gift that should be given. The sender and receiver then reported their dream to the experimenter so no interaction was possible between sender and receiver. In three pairs of dream couples the dream report of the sender actually named the present. There were two dream couples where only the sender remembered the actual gift. Eleven dreamers connected with other dreamers they had not been paired up with. Five couples picked up on each others’ presence in a symbolic way. After a childhood of sharing dreams with my father and being inspired by Patricia Grafields’ Creative Dreaming as a teenager I forgot about dreaming in my twenties. In my late thirties I had the chance to be at an IASD Conference and my dreams started to flourish again. After the closing ceremony I have had nightly encounters with people I knew or would meet later on. My dreams started to become richer more interesting. I was fascinated by dream-meetings where I would sit and talk with people I knew in waking life. But none of those people ever remembered meeting me in their dreams too. I know that when I become lucid in my dream I can easily “go” to people. So if two lucid dreamers would meet in a designated place, one sender, one receiver you could determine a success if the receiver reports the gift in his dream report. I proposed such a thing to the visitors of the Psiber Conference, the annual internet conference organized by the IASD. Mutual dreaming is the event where two people meet in a dream and each has experienced this, remembered this and shared it in the dream report. Dream meshing, a form of mutual dreaming is where two dreamers share dreams emotions or symbols. Experience of the dreamer. I suspected that mutual dreaming can be learned. I divided participants into so called experienced dreamers and less experienced dreamers. This was a non scientific intuitive division. Time zone. My experience with mutual dreaming was that meetings with others could happen outside the sleeping time of the other dreamer. Consciousness seems to be more of a continuum that varies then of a time zone constricted phenomenon. Dream couples where divided according to time zones, except for one couple (see table 1). Emotional affection. I suspected that a strong (positive or negative) attraction would facilitate mutual dreaming. So I divided dreamers into groups that had met each other in the waking world, whether online, in real life or not and people that did not have an emotional connection. Senders got a picture of the gift to help them concentrate while falling asleep. Two people used a photograph of their dream companion. The dream experiment was going to take place in the weekend night of September 28th 4 pm (16.00 EDT) through Sunday September 29th 4 pm (16.00 EDT). People would report back to the email address supplied so no receiver could change his report after reading the report of a sender. There where 30 people, 15 couples that joined this experiment. I have divided them into three groups. Table 1 shows the people who are right on target, table 2 shows the people who picked up on something from the sender or the receiver or picked up something accurate of other dreamers in the experiment and table 3 shows the dreamers who seemed to have made no connection on this particular night. Only 6 people out of 30 participants mention being on the beach in their dream reports. Remarkable was that dreaming was a group experience for two participants. These men are supported by their daughters who dreamed with or for their father. And finally Table 4 shows the couples that did not perceive a right gift or met the other dreamer, but did show a symbolic connection in their dream reports. Deidre K, an experienced dreamer, was given the task of being sender and receiver. She had to receive the fool out of the tarot from Rod. Rod is in a different time zone so if they succeed (they are both very skilled dreamers we would have an indication that mutual dreaming is not restricted to sharing the same time zone. Rod only remembered two flashes of dreams, but his daughter Grace did. She met Deidre K in her dream and reports: “she had long black hair, light brown skin and a red dress. Deidre K then spoke to us and said ‘pleased to meet you’ with great excitement, like taking a step off a cliff (feeling) we gave her the card. She then thanked us, said goodbye and we found ourselves back at the tree”. Here you see how the idea of jumping off the cliff was picked up by Grace, she talks about: “like taking a step off a cliff” when she hands over the card. Isabella, the receiver, is an experienced tarotist. She designed her own deck together with an artist. In this deck the card of the fool is a young girl dressed in a pink dress. Isabella reports: “I’m feeling very responsible and feeling I didn’t come prepared. Didn’t realize what was required. I had selected a lovely light shade of pink fingernail polish for the pretty African American woman. I had thought it might go nicely with one of her 2 pink gowns, especially the one with the rosebud motif. I hadn’t realized I had been supposed to design and create a new dress for her. Could I just cut one of the gowns down and shorten the length? No, I missed the point”. The point missed by Isabella was the fact that the present was right in front of her eyes: the fool who she had “redressed” in her new tarot card deck: Deidre came dressed as Raider Waite’s fool but in her own deck of cards the fool is a young girl in a pink dress. Rod and Deidre K did not know each other apart from the meeting on the PSD, Grace and Deidre never met. Isabella and Deidre K know each other online. So you might conclude from their success that experience can be a dominant factor in facilitating success in challenges like this one. When the emotional attachment is neutral/positive and the time zone is not equal then being an experienced dreamer can create very good mutual dreaming success. 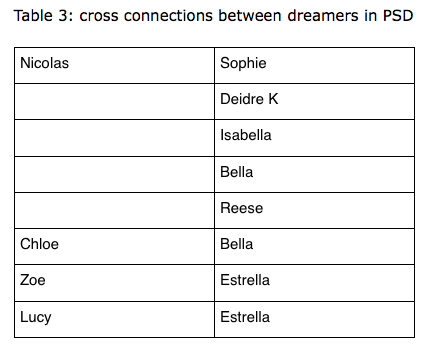 When we discuss the Table 2 about the dreamers that connected with each other we will elaborate on the reports of Isabelle and Deidre K because those dreamers picked up on other dreamers as well. These remarkable dream reports are the only three in the sample where the gift is given and received, although Isabelle “translated” the Rider Waite tarot card of the fool into her own tarot card of a female in a pink dress. Dream couple Reese and Estrella. They are in the same time zone, they know each other online and they are both experienced dreamers. I’m meditating, listening to the ocean, visualizing myself flying to the beach. I see Estrella sitting on the sand with her knees up, arms wrapped around her knees, and I float down and kiss her on the forehead. I open my hands to give her my gift and my hands fill with light. She opens her hands to receive the light. I whisper, “Mariposa. Butterfly. Beautiful Soul,” and the light transforms into a butterfly. I lean my head against Estrella’s where a butterfly is in my hair, and it alights on her hair. I say, “Soul to Soul.” I turn into light and zoom back up to leave, then turn back one last time and extend my hands, as regular hands but luminous. I cross them over each other and wave like a butterfly and I leave. I’ve fallen back asleep so can’t separate which part of the above was mediation and which part became dream. It simply flowed from one to the other. I drift in and out of sleep and have one last dream. During a twilight state, I remember I should go to the beach, and visualize it, with the water to my left. It’s a bit like Malibu beach, but without the stairs – there is nothing man-made in sight. I see a woman dressed in white in front of me, like Reese’s avatar. She puts something into my hands, and to my surprise, it flies away! I am not completely sure if it was butterflies or a bird (it looked like the former, but the word bird came to mind), but I’m pretty sure it was blue. Dream couple Sea and Dexter. Sea is the sender. They are in the same time zone, they are not emotionally attached and they are both experienced dreamers. Sea did not remember a dream. She was the sender and should have given the sunflower to Dexter. Dexter does mention a woman passenger in his report. The onion like bulbs could be Jerusalem artichoke, family of the sunflower. Dream-couple Bella and Vanessa are both in the same time zone and experienced dreamers. They never met in real life. There are several things “Sender” Bella picked up. One of them was the gift sent out by another sender in the experiment. The symbol is infinity and it was sent by Chloe, who reports having no dean recall about this. Maria Cernuto will shed some light in her article on the sender and receiver qualities of people in an astrological sense. This experiment seems to indicate that people can be more “equipped” to function as senders in a mutual dreaming setting while others seem to be more equipped as receivers. In the third section I will discuss the findings of receiver Nicolas who was designated to be a receiver but seemed to be sending out images being picked up by three of the thirty dreamers. “In through my bedroom door walk two nurses, dressed in traditional white, crisp uniformed with caps. The shorter one starts to talk. I ask her what she is doing there, then I become lucid, and excitedly ask if she has something to give me. She looks a bit confused and says she already gave me something but does not tell me what. I tell her we have to go to the beach through a mirror [as per my intent] and lead her out of the bedroom. I am now in a different home and look for a mirror, but my vision starts to go. I say, “clear vision!”, and it gets clearer. I see a few mirrors in a hallway that looks similar to my natal house, but think it would be easier to find a full length mirror. I don’t see one, so decide to go through a round one similar to the one in my avatar. I am holding the nurse’s hand and we go through the mirror. Again my vision is gone, then I wake. 6:00. It is not clear if this is a day-residue, because on the PSD there was a presentation about using mirrors as gate once one became lucid. The connection between Sophie and Nicolas was a symbolic one. Both are skilled dreamers in the same time zone. But as Table 3 shows, Nicolas is an experienced sender and five dreamers picked up on dream, thoughts and fragments he dreamed that night. To test if people are “senders” or “receivers” Nicolas is put in the position of receiver. He was matched with a very skilled dreamer living in the same time zone. As you can see in Table 3, Nicolas connected with multiple dreamers in this experiment. 3:45 AM this was not experienced as an actual dream, but it just seems like some rather intense associations started to go through my mind. Back when I was a high school student, another guy L , pronounced N, and I had become involved in a dispute about a female student that we both liked, but neither of us had ever actually dated her. We agreed to have a fight to settle our dispute. We agreed to meet at the intersection of GOODMAN and CLINTON Avenues. (Nice associational possibilities there.) The time scheduled was a weekend afternoon and a very large crowd of people had assembled to watch the event. I had said that I would wrestle him,and it is my understanding that he agreed to that condition. As soon as the fight began ,I started to rush toward him and he gave me a strong punch in the nose. I protested that he wasn’t honoring the agreement and started to rush at him again and received another strong punch in the face. My nose was now starting to get bloody and I was beginning to get a real puffed up lip. However, I continued with my style of how I thought the fight had been agreed to , and occasionally was able to wrestle him toward the ground, but he continued to hit me in the face. No official winner was declared but I clearly took a real beating and he was pretty much unscathed . It took a couple weeks for the swollen nose and puffed lips to get anywhere near back their usual appearance. This became an obvious lesson to learn in life – that sometimes you have to shift your plans when the conditions change – but I was determined to do it my way ,and wound up with a painful and embarrassing situation that was viewed by a large number of people. It has been said that when someone develops cancer, the organ of choice for the disease to manifest – breast, ovaries, throat etc. dynamically reflects some conflict related to an imbalanced psychological situation. 10 years ago at age 75, I developed angiosarcoma (which is cancer of the blood cells and connective tissue) i in my nose. I had to have a rhinectomy (complete removal of my entire nose,) and was told that my median life expectancy was 15 months. Since I had a big open hole in my face, the new nose was constructed from cartilage from my ears ,with a big flap of forehead skin that had an attached artery and vein, over that structure.— So during that time last morning when I was reflecting on listening to my own internal conversations, I was wondering if I had NOW finally learned my lesson and that my current vision was now improved. Perhaps also adding to the rich metaphorical possibilities about a different vision now, was that I had recently undergone cataract surgery on both of my eyes during the past year. Reflecting on the dream later Sophie noted that she was brought up in Clinton street. I find a wanted poster for Nicolas, in black and white. I paint the outlines of a crude jester’s cap on him, and then paint Maori tattoo patterns on his face, in thick daubs of fluorescent poster-paint. He looks really angry. I wonder if I’ve gone a bit too far. I wake up. “I see a pile of stuffed animals. I’m drawn to a cute stuffed pig. As I retrieve it, it morphs into a mobile, one that usually hangs over a baby’s crib. I see a place over the armoire, in front of a window. It will be beautiful in the light here. I hang it here and admire its beauty. The nose has been broken off. I had not even noticed. There is a separate smiley-face button that I attach. It is placed perfectly and looks cute. I’m smiling”. Here the “nose part” of the dream is referred to. The dreamer replaces the broken nose with a smiley. Later I was back inside the very crowded living room and folks were standing around eating and talking loudly. I had asked for some particular food which didn’t seem to be available, and I said that was okay and forgot about it, because it wasn’t important, but a few minutes later I was going through some half eaten cookies or something up on a shelf , and picked out small pieces with my fingers and then ate them. A work crew – all men, who seem to be doing a job in my neighborhood – knock on my door. They’ve come for lunch, under the impression that I’m providing lunch for them today. They’re a nice group, boisterous, friendly and very hungry. I’m completely baffled why they think I’m supposed to be feeding them, but I scramble around, looking for something I can throw together. I think I pull some sandwiches together. I’m really short on food at the moment, wishing I had more to offer them as they probably eat sandwiches most days and would have preferred something else. We talk as I fly around the kitchen whipping things up and gradually I figure out that my neighbor Valinda made up a schedule for the neighbors to take turns making meals for this work crew but she didn’t tell me today was my day! The guys make the best of it, just eating what I have, being really good sports, and it turns out okay. I think that is what Sophies’s gift was – one of acceptance and forgiveness, and she has a wet towel or some container of wet tissues that you use for car trips .and gave me those. Bella: I was bringing Anubis and Pisgah inside (2 of the 4 dogs I had back then WPR). I am drying them off with a towel and doing cutesy dog talk and kissing their snouts – they were looking at me with adorable expressions. Dreamer Zoe seemed to have connected with another dreamer. This dreamer should give a kitten to her dream partner Jade, but this present was picked up by Estrella who lives in a different time zone. Sender Zoe is a very skilled dreamer. So again this seems to suggest that experience in dreaming transcends time zones. Dreamer Lucy had sent a dragonfly to receiver Estrella. Lucy is an experienced dreamer that connected with Estrella meditating about the gift. Dreamer Virgil had an emotional attachment with receiver Hans, shared the same time zone and is an experienced dreamer. They connected in a symbolic way. Hans’s daughter saw a map of the beach, once more making clear that dreaming is a social activity. Where Virgil had to send a shell on the beach, Hans picked up a bookshelf in his dream. Furthermore there seemed to be a connection between receiver Hans and receiver Ewan. Hans picked up on a bookshelf: Something catches my attention: a shelf constructed of books that support other books. This construction is very artistic but it seems a little chaotic. The woman tells me that is difficult for my friends to make a living in that situation. In Ewan’s report he mentions: Help the J. Book title. Everything seems to be about book title or something of that sort. At first I thought i was alone in all these dreams with no sense of meeting someone, then I realize all the ‘I’s in the dream are being watched by me as they do things, so there are two ‘I’s in the dreams. How characteristic this might be of all my dreams I cannot say. The dream couple Paige and Marty seemed to have reversed roles. Marty acts in this experiment more like a sender, he reports a pregnant woman, while his dean partner Paige mentions a baby (like a bun in the oven, burning like the candle the sender was focusing on. Nathalie and Wendell also had a symbolic transmission. Wendell mentions an apple in his dream report (the gift was a yellow rose) but apples are a fruit from the rose family. Zoe was assigned to give receiver Jacqueline a red rose. Zoe used a photograph of the receiver placed next to her own portrait. Two dreamers did not seem to connect: the last couple Jessica and Lilly. They have never met and did not share the same time zone. Jessica reports meeting Lilly sitting in a chair on the beach receiving the rose and telling the sender „my arms feel like yellow”. Receiver Lilly reports three dreams and one is about fish, this could be a symbolic reference to meeting on the beach. A mutual dream is a dream where sender and receiver share a dream experience with multiple similarities. in this experiment Dreamers that varied in experience and time zone had to meet at a beach (a photo of the place was distributed) and report back to a neutral source. These reports where scanned for similarities and put on the PSD forum for further discussion. Experience seems to be a very important ingredient in experiencing mutual dreaming. Emotional attachment either positive or negative seemed less important in this sample. The most successful mutual dreamers did not seem to have a deep positive or negative emotional attachment other then the determination to meet the other. Time zone does not seem to be relevant in this experiment. My name is Susanne van Doorn, I am a Dutch psychologist. I have been working with psychology, dreams and mythology ever since I finished my study of psychology at Tilburg University. I made this site to share insights, and recent scientific articles about the brain, dreams, and mythology for use in your personal life. A Mindfunda a day keeps the doctor away: a healthy mind in a healthy body. If you are a blogger yourself, you’re invited to submit a blog (if you use the contact form I will get back to you asap) on the subjects of science, mythology or psychology. This entry was posted in Dreams, IASD, mutual dreaming, Susanne van Doorn, Uncategorized and tagged IASD, Keywords: mutual dreaming, meeting in dreams, Psiber Dreaming conference, psiberdreaming. Bookmark the permalink.